Sometimes I stumble upon a Southern Colorado record that is literally a mystery. When I've exhausted every possible means of locating any information, I'll post these finds here - in hopes that someone who reads this blog can help out. As is the case with a group (or person) named Shanon. 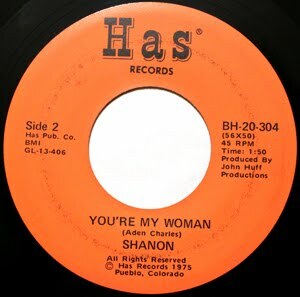 Shanon recorded this country twanger on the Pueblo-based Has record label (BH-20-304) in 1975. Appears it was produced by John Huff. Side A ("Fool Behind the Glass") is credited to Shanon, while the flip side (the rockabilly tinged "You're My Woman") is credited to Aden Charles. Give a listen to these. If you know anything, drop me a line. Listen to "Fool Behind the Glass"
Listen to "You're My Woman"